It is quite a long time ago that I have reported to you about interesting science topics! 1. Probably you have heard about neutrino’s traveling faster than light? That would be a really shocking discovery, if true…. 2. There are rumours going around that next week CERN, during a press conference, will announce evidence for the Higgs boson, a.k.a the God particle. It might be lighter than expected. 3. The Nobel prize for physics has been awarded this year for a discovery, the importance of which can be explained easily to interested outsiders. I will write about it soon. This postl is about the discovery of extra-solar planet Kepler 22b. You may remember that I have written a post in September 2010, about another extra-solar planet, the Gliese 581 g located in the habitable zone of its star. By the way, when you follow the Wikipedia link, you will see that there is some doubt now if this planet really exists. How to discover planets? The stars may be hundreds of light-years away. Planets will not be directly visible at that distance. 1. When a star has a planet, the orbit of this planet can be such that it passes between Earth and the star. 2. In that case, the amount of star light reaching the earth will be slightly reduced during passage of the planet. 3. Measure the light intensity of the star. If there are periodic (minuscule) dips, it could be because of a planet passing. This will give the period of the planet. How large the dip is, will tell us something about the size of the planet. 4. When you know the mass of the star, Kepler’s third law will give you the radius of the planetary orbit, so you can draw conclusions if the planet is in the habitable zone of its star. In 2004, our own planet Venus passed between the Sun and Earth. With a group of friends we have been watching the event. You must take precautions not to be blinded by the sunlight. Here is what we managed to see. 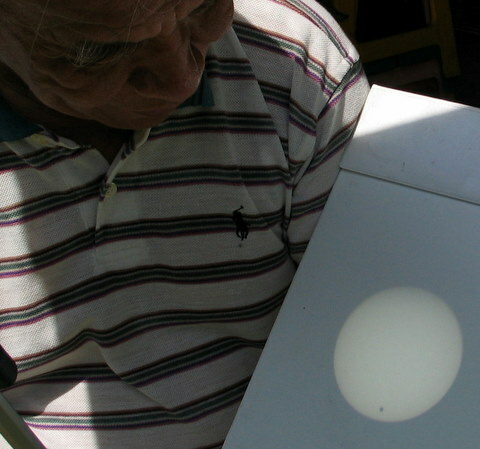 The black dot in the sun’s image is Venus. The Kepler approach will be, to look at the intensity of the starlight and at the dip in this intensity during the passage of the planet. Until now, more than two thousand of so-called Kepler Objects of Interest (KOI’s), have been found. Not all of those will be planets. 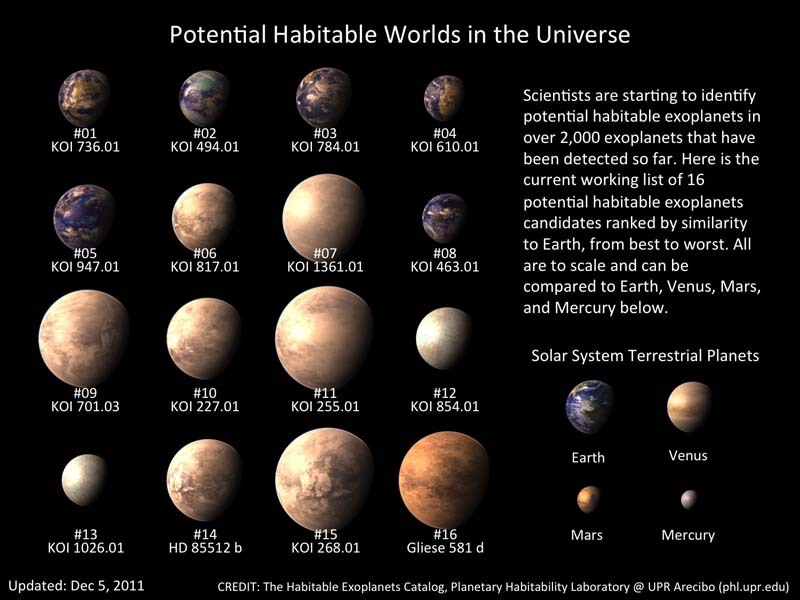 Here is a preliminary list of potential habitable planets, found until December 2011. Now, do NOT be fooled by the “artist impressions” of these planets.The blueish, watery color of several candidates is not based on any factual information about the presence of water. The Kepler data give information about the size of the planet and its location within the habitable zone. It’s amazing that this can be done, for a star that maybe at a distance of hundreds of lightyears, but that’s it, for the time being. By the way, note that Gliese 581 d is still in the list (outer edge of the habitable zone), but Gliese 581 g is no longer mentioned. And also Kepler 22-b is not there, because that is the recent discovery, announced last week, that caused so much excitement. c) The planet is still larger than earth, but not much larger. So it could be a rocky planet. (Large planets, Jupiter size, will be gaseous) A rocky structure and liquid water are often seen as prerequisites for the development of life. 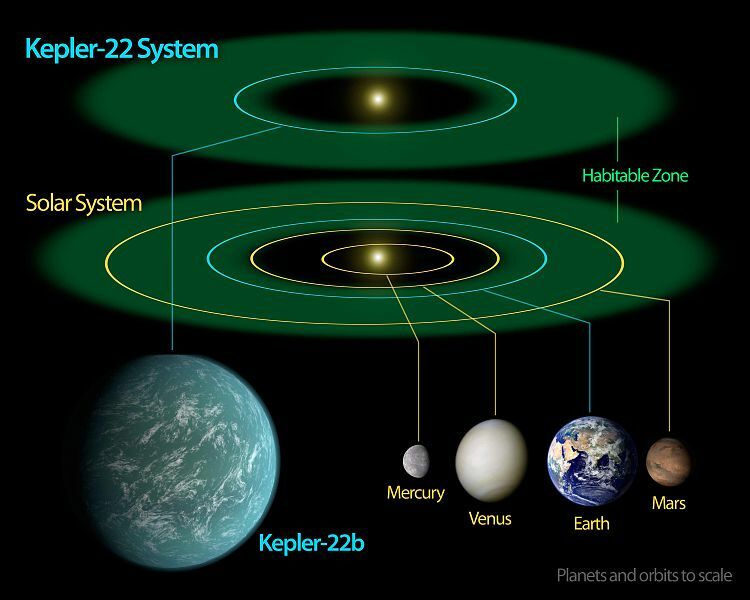 Again, the image of Kepler-22b in the above picture is an artist impression! 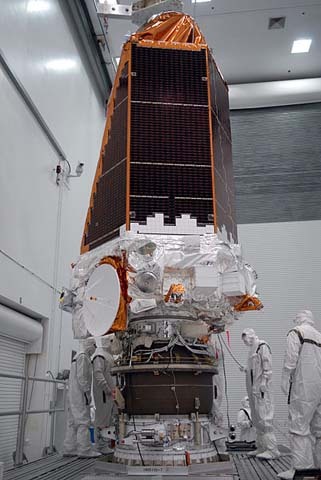 The official website of the Kepler Mission ,well-designed, very interesting. Do you want to help? Kepler is monitoring more than 150.000 stars, and is using computer software to look at recurring “dips” in the received starlight. A huge job. Humans are still better in pattern recognition. So why not become a planet hunter yourself?